The Memorex MVD4544 is a DVD recorder that uses progressive scan technology to give you crisper and shaper images and videos. You can conveniently record DVD Video, CD-RW, CD (Audio), and CD-R on this Memorex DVD recorder. The resolution of 480dpi in this Memorex dual deck player gives you superb quality images. The automatic digital tracking used in this Memorex DVD recorder gives you improved sound of voices. The Memorex MVD4544 has a Six-head VHS tape player that provides you with improved quality sound and video. The 16:9/4:3 ratio switch of this Memorex dual deck player connects to any style of TV. The Memorex MVD4544 has AV inputs on the front as well as at the back for ease of use. The published description of this machine is DVD RECORDER. Most people who buy a unit labeled DVD recorder would expect it to record DVD. But it does not. It only PLAYS DVD. It will not record new DVD for you. The machine is designed like those units whose specific job is transfer old VHS tapes to the DVD medium. This looks like such machines, with a VHS slot on one side, and a DVD portal on the other. But you can not transfer anything. You can both record and play back VHS tapes. The playback of both styles of recording is okay, and the tape recording is acceptible. If you only need a machine to play DVD and not record discs, this might be satisfactory for you. Space saving, great performance, lacks newer deatures. I found this unit to be a space saving, good looking machine with only 1 drawback - no HDMI. 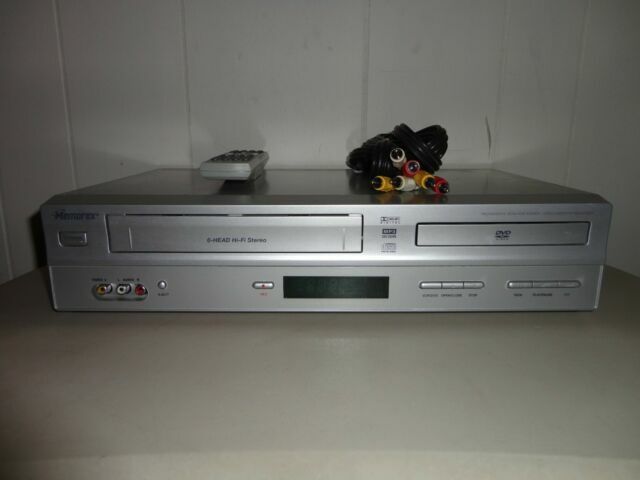 With a unit such as this containing a 6 head vcr and a progressive scan dvd player, one would come to expect at least 1 input and 1 output that was HDMI. Other than that 1 drawback I found the unit to be of good construction with easy to use controls, both on the unit and the remote. The video output was very clear and the sound decent. I would recommend this unit to anyone trying to save space with a non high definition television. Came 8 days early. Super well packed in box. Snug fit with several layers if bubble wrap. Looks brand new. For those folks that still use VHS and DVDs, this is good equipment to have.